The Sports Emmy Award-winning episode of UFC Fight Flashback: Diaz vs McGregor 2 is available now and for free on UFC FIGHT PASS. UFC Fight Flashback captures the unique drama of the day starting with the stars’ arrivals at the arena before the event. We see them warming up, getting their hands wrapped, making the walk to the Octagon. And once the two men are face-to-face, they engaged in five of the year’s greatest rounds of combat sports. The story continues backstage after the decision is read, as the victor celebrates on crutches, celebrities mingle, and both men face the media at the post-fight press conference. 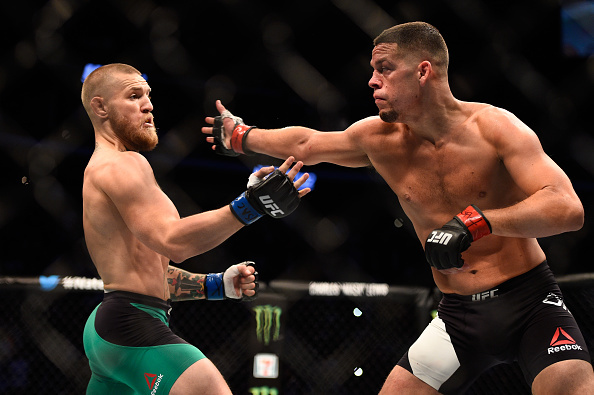 The episode, which won a 2017 Sports Emmy for Outstanding Editing Sports Coverage along with the NFL's Super Bowl 50, features the second welterweight bout between featherweight champion Conor McGregor and longtime veteran Nate Diaz. The two fan favorites first met in an unlikely main event that March, and their explosive chemistry immediately captivated fans. The calculated and polished Irish champion had met his trash-talking match in the brash, West Coast scrapper. Come fight night, McGregor raced to an early lead before being submitted in the second round. But rather than retreating to lick his wounds, McGregor demanded a rematch. With the buildup taking place over the course of multiple press conferences and media appearances, expectations were sky-high for the bout -- and it delivered. These aren’t your typical broadcast cameras replaying a sporting event. Our unique angles and spectacular high-speed cameras make it a heightened optical viewing experience, revealing normally hidden elements of the fighting world -- such as the emotional roller coaster ride of family, friends and other spectators Octagon-side. Exclusive pre and post-fight interviews with Diaz and McGregor provide the narrative, with additional real-time sound from their corners, the referee and the UFC commentators. This storytelling approach takes you inside the fighters’ experience and recollections of the event. The editing and sound design are of the highest caliber, artfully amplifying the inherent drama of the athletic competition. Watch it now for free on UFC FIGHT PASS.